Description: Revolutionize Your Life and Rewrite Your Future With the Power of Words. Just like natural laws, there are spiritual laws with cause and effect. God set the universe in motion with the power of His words and established the law of confession, but many believers have suffered needlessly by misunderstanding the power of their words. Dr. Bill Winston, pastor, Bible teacher, and host of the national television program Believer’s Walk of Faith broadcast to over 100 million homes, reveals scriptural examples and vital teaching on the importance of the spoken word. Believers will uncover the enemy’s deceptive plan to use their own words against them and what they can do to turn their situation around. 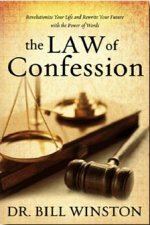 "One of the best things that ever happened to me, my family, and my church, was the revelation of the law of confession - we learned that the moment we win the battle over our words, we win the battle!" Controlling your words is one of the biggest challenges anyone will face in this life; the Bible reveals that the power of life and death are in the words you say. As you begin to change the words you speak, you will rewrite their future and revolutionize your life.